We’re a group of Maine women who seek adventure in our lives. We all have different definitions of what an adventure is. What does it mean to you? The LAC offers a variety of day and overnight adventures. Club membership includes a patch, a sticker, and a booklet of local, Maine adventures. Network with like-minded, courageous women. Make connections with other women who want to get outside and play. 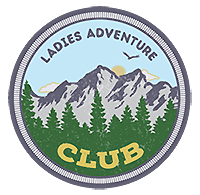 Ladies Adventure Club Past Adventures!